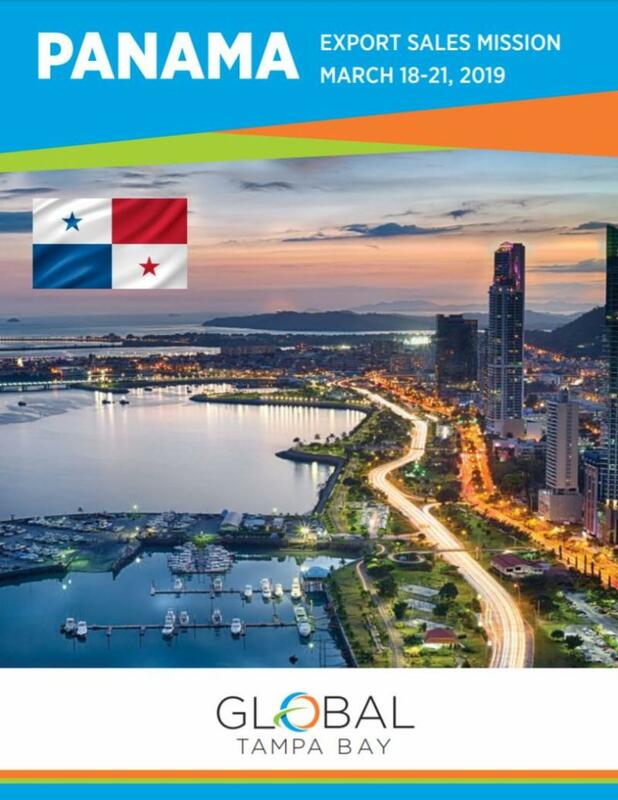 Pinellas County, Fla. (December 20, 2018) - Local companies interested in increasing business with Latin America are encouraged to sign up for Global Tampa Bay's export sales mission to Panama City, Panama from March 18-21, 2019. This export sales mission features the U.S. Commercial Service Gold Key Program, which offers personalized one-on-one appointments with potential customers in Panama City. Interested companies will receive an initial market evaluation prior to acceptance into the program and should apply by January 21, 2019. There is a delegate package available for interested parties as well. The registration deadline is February 4, 2019. "The Tampa Bay region has a history of doing business in Panama, and this mission will build on that foundation," said Mike Meidel, Director of Pinellas County Economic Development and 2019 Chair of Global Tampa Bay. "Working with our partners at the U.S. Commercial Service, we can connect our local companies directly to prescreened and scheduled appointments designed to further the personalized goals of each business owner." What makes Panama an ideal export partner? Open trade policies, zero tariffs, and a dollar-based economy offer local companies significant trade opportunities and foreign investment. Tampa is also home to the closest deep-water port to the Panama Canal and Tampa International Airport offers nonstop daily flights to Panama City. Panama is Florida's 10th largest export destination. The state already supplies 30% of the total U.S. exports to Panama, which in 2017, translated to $1.9 billion. The multi-day mission, Global Tampa Bay's first of 2019, builds upon previous economic activities targeting Central and South America. In fiscal year 2018, export sales missions to Mexico City, Mexico and Santiago, Chile, yielded more than $38 million in projected future sales and economic activity for local companies. The top sectors for U.S. exports include agricultural products, automotive parts, building products, and computers, as well as hotel and restaurant equipment, medical equipment, safety and security equipment and telecommunications equipment. The export sales mission to Panama is made possible through sponsorships from Port Tampa Bay and Tampa International Airport and in partnership with Enterprise Florida. For more information, interested companies can visit Global Tampa Bay's website or contact Brent Barkway at bbarkway@pinellascounty.org for a Gold Key application. Pinellas County Economic Development (PCED) offers customized assistance for export planning and can serve as a single point of contact for international business programs available at the federal, state and local levels. We provide assistance with trade mission planning, including Gold Key matchmaking events, international marketing plans, and international trade show grants. Contact Brent Barkway at bbarkway@pinellascounty.org or (727) 464-7411. Global Tampa Bay is a cooperative effort between Pinellas County Economic Development, the Tampa Hillsborough Economic Development Corporation and the Pasco Economic Development Council, established to help existing Tampa Bay companies to expand their sales in international markets and to assist foreign companies interested in establishing operations in the Tampa Bay region. Global Tampa Bay conducts joint export activities, such as seminars, trade events and trade missions, and supports the export-related growth initiatives of regional economic partners, including Tampa International Airport and Port Tampa Bay.